Here you will find printable flyers, posters, and bulletin inserts to use for the upcoming music concert. This material may be downloaded, printed, and distributed at will. AdventHealth University presents the next program in the "Power and Glory of God Through Music" concert series on Saturday, February 23 at 5:30 pm at First United Methodist Church of Orlando and features a 80-voice choir, 45-piece orchestra and 81-rank Aeolian-Skinner pipe organ. Musicians include members from local SDA churches, various other denominations in the community and the Orlando Philharmonic Orchestra. The concert is free and ample parking is available. Please visit www.CenralFloridaMusical.com for more information. AdventHealth University is proud to sponsor a sacred concert on Saturday, February 23 at 5:30 pm at First United Methodist Church of Orlando featuring an 80-voice choir, 45-piece orchestra and 81-rank Aeolian-Skinner pipe organ. Musicians include members from local SDA churches, various other denominations in the community and the Orlando Philharmonic Orchestra. The concert is free and ample parking is available. Please visit www.CentralFloridaMusical.com for more information. You are invited to attend a concert of sacred music on Saturday, February 23 at 5:30 pm at First United Methodist Church of Orlando featuring an 80-voice choir, 45-piece orchestra and 81-rank Aeolian-Skinner pipe organ. Musicians include members from local SDA churches, various other denominations in the community and the Orlando Philharmonic Orchestra. The concert is free and ample parking is available. Please visit www.CentralFloridaMusical.com for more information. Christ Our Song! Join us for a concert of sacred music on Saturday, February 23 at 5:30 pm at First United Methodist Church of Orlando featuring a 80-voice choir, 45-piece orchestra and 81-rank Aeolian-Skinner pipe organ. Musicians include members from local SDA churches, various other denominations in the community and the Orlando Philharmonic Orchestra. The concert is free and ample parking is available. Visit www.CentralFloridaMusical.com for more information. 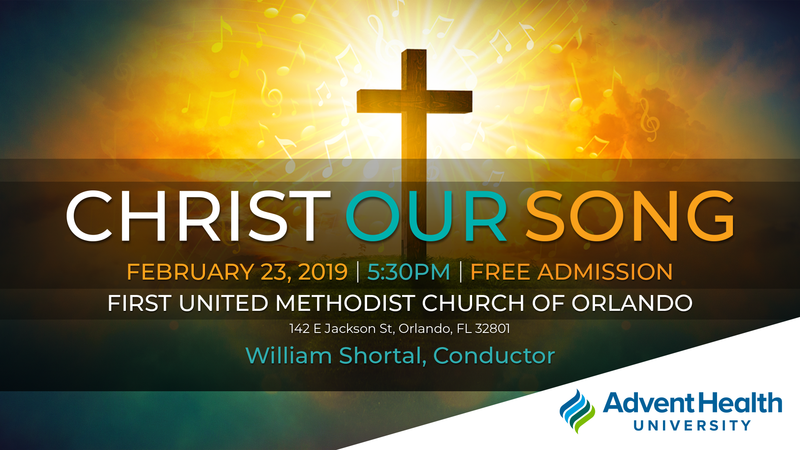 You are invited to attend "Christ Our Song," a sacred concert featuring a massed choir and 45-piece orchestra on Saturday, February 23 at 5:30 pm at First United Methodist Church of Orlando. Admission is free and ample parking available. Please visit www.CentralFloridaMusical.com for more information. You are invited to attend a sacred concert sponsored by AdventHealth University featuring an 80-voice choir and 45-piece orchestra on Saturday, February 23 at 5:30 pm at First United Methodist Church of Orlando. Admission and parking are free. Visit www.CentralFloridaMusical.com for more information.